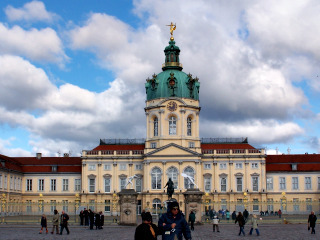 The U-bahn from Adenauer Platz took us to Richard Wagner Platz and Otto Suhr Allee where we walked west to the famous Schloss Charlottenburg with its striking dome. The palace was built as the summer residence for Queen Sophie Charlotte from 1695-1713. Frederick the Great added a new wing in 1740-42 which houses a splendid porcelain collection. The interior is decorated in opulent rococo and baroque style. There is a large garden and woodlands behind the palace as well a mausoleum, belvedere, theatre and pavilion. Visitors flock to this landmark for the abundance of photo opportunities. After this we needed a bit of sweetness in our lives. We were looking forward to a return visit to Tillmann Bio Konditorei, LudwigkirchStr 14. We found they had moved to larger quarters on the same street. Now there are more showcases to display their awesome delights and comfortable indoor seating. All the cakes, tortes, cookies etc. are 100% organic and produced by hand. They are a leading supplier to all the organic shops in the city. It took us considerable time to make a selection dodging between the anxious customers lined up at the counter. The sweet staff was very patient with us. We shared black forest cake and apple-almond torte - to die for. The cappuccini were perfectly prepared. Chatting with Christine Tillmann she recommended we take a short walk from her shop to the picturesque Victoria Luise Platz with its oval shape, attractive fountain in the middle, gardens around and impressive trees lining the perimeter. It dates to 1900 and was named after Victoria Luise of Prussia, the daughter of Kaiser Wilhelm II of Germany and great granddaughter of Queen Victoria. Today it is the center of an upscale residential area in the Schoneberg district not far from Ku' Damm. MotzStr proved to be trendy area with many interesting young fashion shops just as Christine suggested. I know we just had superb cake and torte but how do you pass up a cute ice cream shop that was screaming come on in. Eis, Franken & Grunewald is at the corner of MotzStr and GossowStr and is now on our not to be missed list. Judging from the awards and write-ups posted, many others agree. Rich chocolate, ground bean cappuccino and strawberry made us believers. We met Louis near his home at one of his favorite neighborhood restaurants, Picanto, BayerischeStr 12. Many restaurants have signs in their windows and listings on the menu for "Argentinean steaks", which we assumed was a marketing ploy. Argentinean steaks seemed to be the specialty of the house, let's not fight it. At Louis suggestion we chose the rump steak. What was served was a thick 300gr filet mignon grilled medium rare, fork tender and juicy. Argentina does export a lot of beef; guess it's not just marketing after all. The fried potato wedges were pure German as was the beer. The owners are very sweet and take special care of their customers. The "Memorial to the murdered Jews of Europe" is located between EbertStr and WilhelmStr just south of the Brandenburg Gate. It was built between 2003 and 2005 according to the design of architect Peter Eisenman. His work had a stunning effect on us. What was the meaning of 2711 gray colored concrete stelae (of different sizes and shapes) constructed in a grid pattern one can wander through from all sides with no clear continuous path? As we chose our own path straight ahead, right, left, backward we each had our own thoughts and feelings as to how this experience related to the subject of this memorial. It was emotional, perhaps the objective of the designer. The re-awakening of our Holocaust sensitivities above ground was highly intensified in the underground information center. Designed by Dagman von Wilcken it dramatically provides information on the victims, the places of extermination and today's memorial sites. The tour starts by surveying the Nazis' extermination policy between 1933 and 1945. 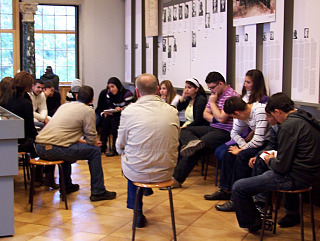 The personal accounts of fifteen persecuted Jewish men and women are the focus of the "Room of Dimensions". The "Room of Families" reflects the diversity of European Jewish culture and tradition before the Holocaust. Painfully documented is the contrast of life before, during and after the Nazi persecution, the destruction of this culture and the loss it created. Photographs and personal documents depict the dissolution, expulsion and extermination of these fifteen families. The names and short biographies of Jews across Europe who were murdered or presumed dead are recited in the "Room of Names and Pages of Testimony from Yad Vashem". In an adjoining foyer visitors can search victims' names in the database of names from Yad Vashem in Israel. The "Room of Sites" documents the geographic spread of the genocide of Jews across Europe. The tour ends at the Holocaust Memorial's own database where computer terminals provide access to information on current events at historical sites and on research institutions throughout Europe. Our day of remembrance continued with a visit to the "House of the Wannsee Conference Memorial and Educational Site". 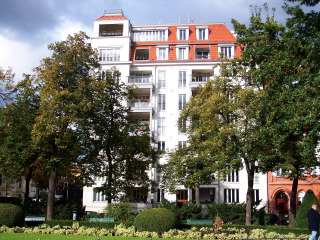 Wannsee is about 15 minutes south west of the city by S-bahn from the Charlottenburg station. Bus #114, outside the Wannsee train station took us to the site. Exquisite villas, one of which was built by an industrialist in 1915 and used by the SS from 1941 to 1945 as a conference center and guest house, surround Wannsee, a beautiful lake. "On January 20th, 1942 fifteen high ranking representatives of the SS and NSDAP and various ministries met to discuss their cooperation in the planned deportation and murder of the European Jews. The SS representatives reported to the state secretaries present on the murder campaigns which had been carried out by special units in the Soviet Union since August 1941 and on the killing methods already in use." "The meeting was chaired by Reinhard Heydrich, head of the Reich security main office. His deportation expert, Adolf Eichmann drew up the protocol of the meeting, which was found in 1947 in the foreign ministry files. The Wannsee Protocol documents with alarming clarity the plan to murder all European Jews and the active participation of Germany's public administration in this genocide." The invitation to each of the participants of the conference ended with, "the meeting will be followed by breakfast" - just another day at the office. The permanent exhibition documents the prehistory of the National Socialist persecution of the Jews, the process of social exclusion, deprivation of rights and expulsion between 1933 and 1939, and the deportations, confinement to ghettos and murder of the European Jews in German controlled territories. The central focus is the conference that took place in the dining room. Short texts in German and English describe these events, which are recorded in documents from the perpetrators files as well as victims' statements, photographs, sound and film recordings. The history of the fifteen participants is documented. From their prewar lives, military careers, to their ultimate fate. Unfortunately some escaped or had only mild punishment. Some are alive and living ordinary lives, enjoying breakfast everyday. There are various programs offered to youth groups, school classes, trainee teachers and school teaching staff and adults engaged in political education or vocational training. On this day we saw several groups of young people being guided and informed. Wherever we travel we most enjoy the local traditional home style favorites. Gausthaus Krombach, MeinekeStr 4, came through for us just as it did in 2002. The Konigsberger Klopse (large meatballs with caper sauce) served with boiled potatoes, and crisply grilled bratwurst with divine mashed potatoes and heavenly sauerkraut were exactly as we remembered, as was the Krombacher beer. This is the place for simple traditional German fare at reasonable prices. While waiting outside our hotel for Louis, the attractive, hand made, gold jewelry in the window of the UK (Ursula Kranz) jewelry shop next door caught our eye. We went inside and were impressed with the unique collection on display. Ursula is charming and obviously talented. If you're in the market for a unique piece of jewelry, check out UK. Louis suggested we take the U-bahn to Alexanderplatz to walk east along Karl Marx Allee. The square is the transportation hub in the Mitte district with both S-bahn and U-bahn connections. The station design features the opening scenes from movie Flightplan. The 6 level extraordinary Kaufhof Department store is worth a visit and if you're a shopping addict there is the Alexa Shopping Mall. Other sights are the Brunned der Volkerfreundschaft, Fountain of Friendship amongst Peoples, the World Time Clock and the 365m high TV tower topped by a globe with a rotating viewing platform (Berlin's tallest structure). Nearby is the glorious Rotes Rathaus (Red City Hall). 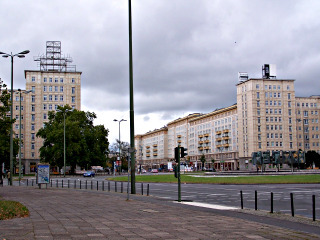 Karl Marx Allee is a monumental socialist boulevard, about 90m wide and 2km long. It was built by the GDR between 1952 and 1960 as a model for East Germany's reconstruction program after the war. The tall 7 to 9 story buildings that line this colossal way are a testimony to the classic socialist design of the 1950s. They were built to provide workers with large and luxurious apartments. At each end are dual towers at Frankfurter Tor and Strausberger Platz, which were renovated after the reunification. There are restaurants, cafes and shops along the way as well as a hotel and giant cinema. The contrast between this and the city west of Alexander Platz was stunning. It was Saturday and considering the density of the buildings, it was remarkable that there were so few people on the street. We had the area to ourselves or I should say, we felt lost on the street. We took the U-bahn to Hausvogtei Platz to visit Gendarmenmarkt and found a shop that features a realistic model of the city center. 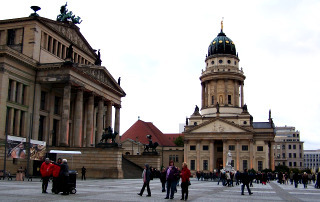 Gendarmenmarkt is a spectacular square and a tourist favorite. It's the site of the Knozerthaus and the French and German Cathedrals, each a beauty. In the center is a statue of Germany's poet Friedrich Schiller. Most of these buildings were badly damaged during the war, but have been restored to the original state. Four and five star hotels along with restaurants and cafes abound in the vicinity. The famous Fassbelder & Rausch Chocolatiers am Gendarmenmarkt has an enormous selection and spectacular presentation. It was a zoo with eager buyers queuing to pay. Unfortunately there were no samples offered. Berlin's parliamentary quarter is comprised of four buildings; the Reichstag and three new dynamic buildings linked by a series of tunnels and walkways. 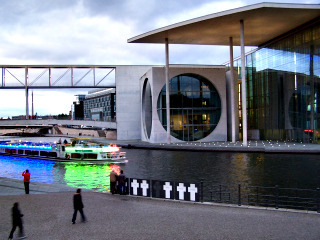 The Jakob Kaiser Building and the Paul Lobe Building lie on the western bank of the Spree River along with the Reichstag. The Marie-Elisabeth Luders Building graces the eastern bank, connected by a double footbridge, the lower level of which is open to the public. The contrast of the historic architecture of the Reichstag and the modernism of the three new edifices vividly illustrates the vitality of the city of Berlin, the old living in harmony with the new. Louis again joined us for a final stroll around the neighborhood. He had two Jewish sites in mind to share with us. The first was the Judisches Germeindhaus (Jewish Community Center) and It's Gabriel's Kosher Restaurant on FasanenStr just north of Ku' Damm. We wandered the streets looking for a spot for coffee and pastry. Arriving at KantStr we were getting desperate and suddenly there in front of us was a window filled with awesome delights. Kant 138 Der Kuchenladen was a dream come true. Each item displayed in the showcases and shelves was individually designed with a keen sense of color and shape. Only natural ingredients are used (other than a few decorations), the textures are dense and the flavors intense. There are only 4 tables and they were all full so we had time to make our choices. We were there for about one hour and in that time there was a steady stream of patrons walking out with boxes and bags brimming with goodies. 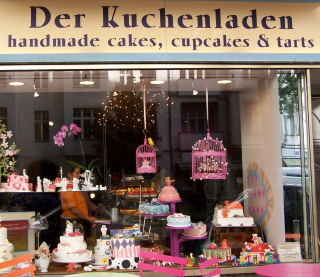 Made to order cakes and novelties are very popular. Word got out that we were from Toronto and a delightful young lady appeared from the kitchen to tell us she too was from T.O. and had just moved to Berlin. She chatted with us a while explaining that we were in an Asian area. She recommended the best restaurants - next trip! A table finally opened up and we placed our orders. 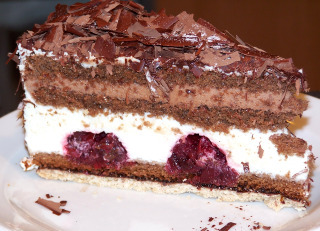 I chose a beauty named Chandera, a white cake about six inches high irregularly layered with chocolate fudge, whipped cream and fresh raspberries and topped with crunchy muesli and sour cherries. Linda had plain cheesecake, which she claimed was better than New York cheesecake, until now her all time favorite. Louis had the fresh plum tart. Linda was further thrilled with her hot chocolate made with real chocolate and thick whipped cream. The cappuccino and latte were perfection too. This was our lucky day! Just how lucky we didn't even know at this point. Louis guided us to nearby PestalozziStr 14-15 where the plaque on the outside of a red brick apartment building indicated it was the Pestalozzi Synagogue. As we were trying to determine how to find the synagogue a senior couple and their daughter-in-law came toward us and asked if we would like to see it. They lived there and opened the entrance door of the U-shaped apartment building. There in a courtyard behind the lobby stood the Pestalozzi Synagogue. The synagogue was built in 1911-12 as a private place of worship until it was taken over by the community in 1919. It was common for synagogues in Berlin to be tucked away behind an inconspicuous entrance. It has a massive red brick facade typical of German medieval architecture. There was only slight damage from fire during the Kristallnacht pogrom. It was used as a community laundry during the war. Services resumed in 1945 with the congregation sitting in garden chairs. It became the community center for those who survived underground. It was renovated in 1947. Though now a liberal synagogue with an organ and mixed choir, seating remains separated by gender. We were not able to go inside as it was closed on Sundays. We were most fortunate that these kindly people exposed this hidden treasure for us. The restaurant Lutter and Wegner dates back to 1811. We went to the one near us at SchluterStr 55. There is another in the Gendermenmarkt. Both claim to be the original. This one feels like a German Bistro. Lower walls of dark wood topped with large framed posters. There is a short list of traditional offerings on the menu, which is supplemented with daily specials. The house breads and chive cream cheese along with a Berliner beer made for a comfortable beginning. Linda enjoyed a vegetable plate with a spicy potato goulash while I had excellent roast duck with red cabbage and soft sticky potato balls. The evening would have been perfect if our waiter was not so aggressive trying to sell us appetizers and wine. 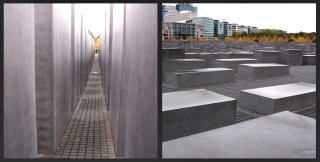 Berlin is a city of bountiful experiences that should be on your must visit list as it offers something for everyone. Bus #109 whisked us to the airport. Our flights were on time and the fine KLM service made the trip home comfortable and relaxing.